I Confess (1953) is perhaps the most underrated movie in Alfred Hitchcock's impressive filmography. This thriller about a priest who must remain silent about a murder confession stars Anne Baxter and Montgomery Clift and was filmed on location in Quebec City, Quebec (photo above). This article is part of the O Canada! Blogathon hosted by Speakeasy and Silver Screenings. A gentle warning that there are spoilers ahead. 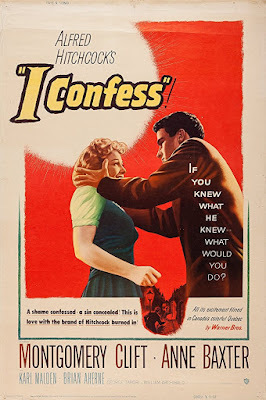 I Confess (1953) is perhaps the most underrated of the five films director Alfred Hitchcock made for Warner Bros. in the early 1950s. 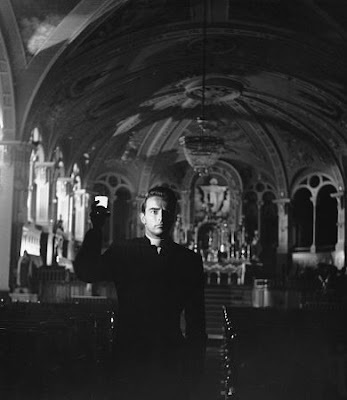 This thriller about a priest (Montgomery Clift) who is forced to keep a horrifying secret is suffused with Hitchcock's deep Catholic faith and his pure cinema style, but it is almost never spoken about as one of his greatest films. In this article, I'll write about the origins and production of I Confess and give you some examples of why I think it should be considered among Hitchcock's masterpieces. The plot of I Confess concerns dedicated priest Father Michael Logan (Clift). While praying late one night at his parish, Father Michael is confronted by the church's custodian Otto Keller (O.E. Hasse) in an extremely agitated state. Otto demands that Father Michael immediately hear his shocking confession to the murder of a local attorney, Monsieur Villette (Ovila Legare). Father Michael urges Otto to go to the police and tell them the truth, but the stubborn man refuses even when Father Michael becomes the prime suspect. I Confess is based on the French play Nos deux consciences by Paul Anthelme, which Hitchcock saw in London in the early 1930s. Hitchcock later claimed that he was "haunted" by this play about an innocent priest who goes to the gallows rather than violate his sacred duty, but the director didn't begin to seriously consider the project until the late 1940s when he bought the rights to the play for his independent production company, Transatlantic Pictures. After Transatlantic folded, I Confess moved with Hitchcock to Warner's where the script went through draft after draft from about a dozen writers while Hitch worked on Stage Fright (1950) and Strangers on a Train (1951). The censors also had their way with the script; they nixed Father Michael's execution and a plot point about the priest fathering an illegitimate child. Hitchcock also had to deal with a last minute cast substitution when Swedish actor Anita Bjork, who was the director's first choice for the role of Father Michael's former love interest, had a baby out of wedlock. Against Hitchcock's wishes, studio chief Jack Warner pulled Bjork from the cast (he was afraid she would become the subject of a scandal a la the recently disgraced Ingrid Bergman) and replaced her with well-regarded thespian Anne Baxter, who was promptly bleached blonde and shoved on a plane to Canada before she even knew much about the part. Despite these difficulties, the filming of I Confess went relatively smoothly. 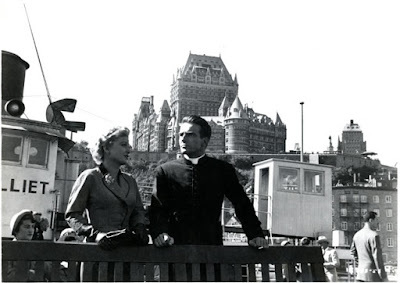 The generous citizens of Quebec City were eager to assist in the filming (many of them appear in small parts in the movie, most recognizably local schoolgirls Carmen Gringas and Renee Hudon) and the Catholic Church allowed Hitchcock to use several of the city's most beautiful churches free of charge (The clip above is newsreel footage of I Confess' Quebec premiere). Clift spent several weeks at a Quebec monastery learning about the priestly vocation and how to walk in the cassocks favored by Quebec City clergy, but his laborious method acting style sometimes clashed with Hitchcock's more forthright approach to filmmaking. The director's daughter, Patricia Hitchcock O'Connell, later remembered that it took around 40 takes for Clift to satisfactorily walk down a hallway, and he would often ask about his "motivation" for filming a scene. 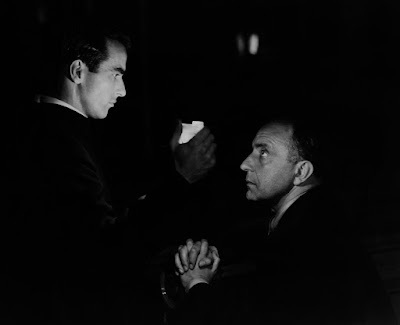 In one instance, Clift asked why his character would look up in a particular scene; Hitchcock dryly replied, "so I can make a cut." 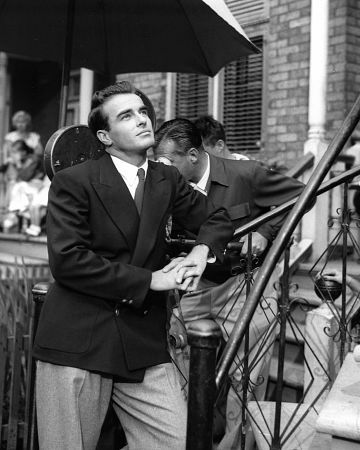 Montgomery Clift films a scene from I Confess (1953) in Quebec City. 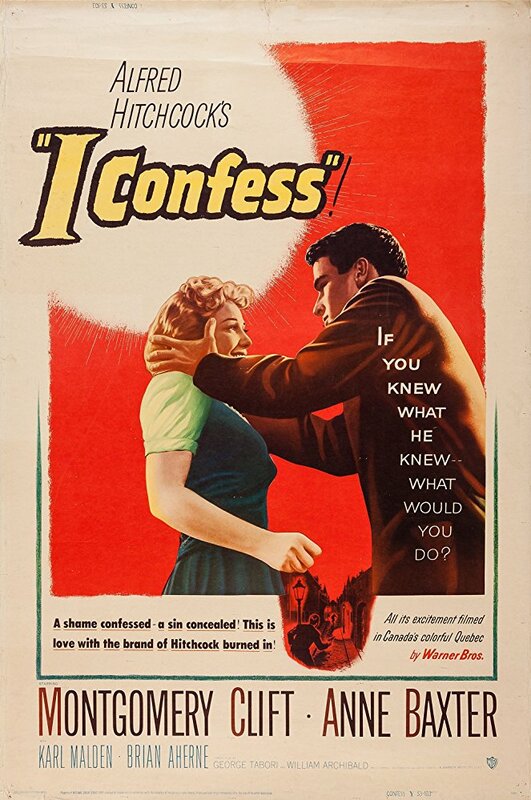 I Confess was a hit at the box office when it was released in 1953, but critics gave middling to poor reviews. The often acerbic Bosley Crowther of The New York Times sharpened his goose quill dipped in venom (Waldo Lydecker reference) to pen a scathing review that complained about the movie's "droning pace," Clift's "bewildered expression," and, most curiously of all, Baxter "breathing heavily." The movie's critical reception hasn't fared much better in the years since. Most sources I read referred to the film as "flawed" or a failure of the Hitchcock style. Even so, I Confess was highly praised by the auteurs of the French New Wave and, from what I can tell, the online commentariat now seems to embrace the movie. While I Confess isn't a masterpiece from start to finish like Rear Window (1954) or North by Northwest (1959), it is a masterful piece of filmmaking that reveals much about Hitchcock's cinematic obsessions. Hitchcock was the master of using the establishing shot to create atmosphere and tension in his films (if you don't know what that means there's a detailed explanation here, but basically an establishing shot is a wide-angle shot, most often of a building, that literally establishes the movie's location or setting). The opening scene of Rebecca (1940) is probably the most brilliant example of Hitchcock using an elaborate establishing shot to set the mood for a film, but the director also uses the same technique quite well in I Confess. The credits of I Confess feature a wide-angle shot of the Chateau Frontenac from the St. Lawrence River (clip above) followed by a series of establishing shots (the first 36 seconds of this clip) that showcase the old-world charm of Quebec City . The phrase "pure cinema" often gets used in regard to Hitchcock's filmography, although the explanations for what this means are sometimes not entirely clear (in other words, film writers throw around a lot of big words that don't really mean all that much). The simplest way to define pure cinema is to call it visual storytelling; silent films in their most elemental form are pure cinema, but if you want a more recent example try the Academy Award-nominated movie Dunkirk (2017). 1. Keller's identity as the murderer. 2. The two schoolgirls witnessing Keller leaving the crime scene. 3. Keller concealing the crucial clue, i.e. the priest's cassock. 4. Father Michael observing Keller. Hitchcock had a lifelong obsession with being falsely accused of a crime, and he returns again and again to the "wrong man" scenario throughout his body of work. I Confess is one of the most serious of his films dealing with this theme. Like all Catholic priests, Father Michael cannot speak about anything he hears in the confessional, which prevents him from revealing the real identity of the murderer even when he is falsely accused of and put on trial for the crime. Hitchcock illustrates the crushing burden of Father Michael's assumed guilt by a series of claustrophobic closeups and high angle shots of Clift (trust me, you'll spend a lot time staring at the back of Monty's head in this movie). I'll leave you with this clip of Oscar-nominated director and self-confessed "sad and guilt-ridden Catholic" Guillermo del Toro talking about I Confess. I Confess is available on DVD and video on demand. Great post about a great movie. To me, this is another example of Hitchcock's genius being somewhat overshadowed by the cinematic leviathans from his "suspense" era. My favorite example for that is Foreign Correspondent. I agree about Foreign Correspondent. It seems that critics go on and on about his late fifties output without discussing the rest of his body of work. Marvelous review. I Confess is a film that I appreciate more each time I view it, and there's the story - I always return to it. That Hitchcock knew what he was doing. Amanda, I have never seen this film in its entirety, because sometimes Hitch's Wrong Man scenario is way too stressful for me. (Yes, I am a delicate flower.) But your post has convinced me to give it another go; I was relieved to find out Monty isn't executed in the end. Thank you for joining the blogathon, and for sharing your knowledge and research on this film – and Hitch's filmmaking style in general. I think Bosley Crowther liked writing snarky reviews about movies. I hope to visit one day too. You're lucky to live in such a beautiful place. I love I CONFESS and totally agree about it being underrated! It has a look all its own, thanks to this wonderful setting (a character all its own) and also to me, is the most noir-looking and feeling of Hitchcocks. Thanks for writing about it for the blogathon! This one and Strangers on a Train are his most noirish films. Thanks for hosting.